Podcast app "Castro" updated to version 3.0 this week, introducing a collection of notable additions like a rebuilt player engine, cleaner layout, Apple Watch app, and more. 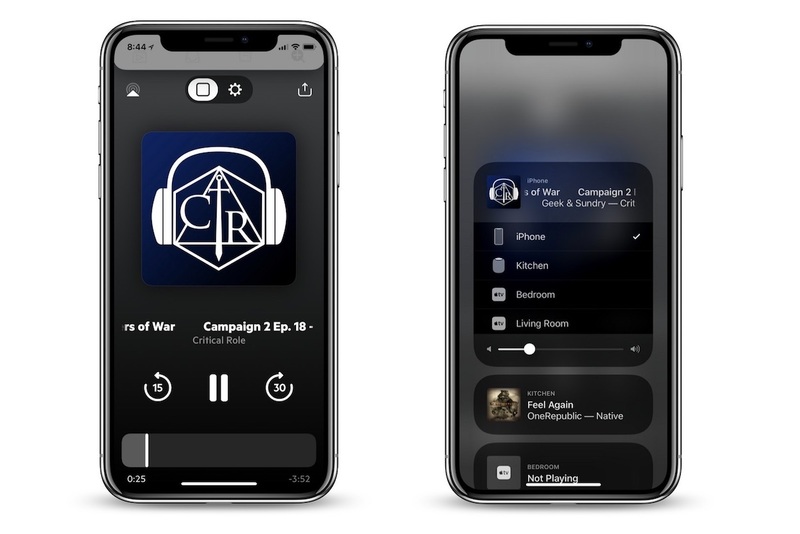 Developer Supertop Software says that Castro 3 is "much faster" when users start streaming a podcast and the app's controls are more responsive thanks to a simpler layout on the player screen. Users can now star the current episode they're listening to from the player by double tapping the artwork, and in this screen there are also newly accessible AirPlay controls for streaming podcasts to other devices with fewer steps. Additionally, Supertop has rolled out an Apple Watch app for podcast playback, letting users control their podcasts and choose new episodes from their queue to play. Castro is a free app to download [Direct Link], and the app supports in-app purchases for Castro Plus at $8.99 per year or $2.99 per quarter. Castro Plus offers advanced features like mono-mix, chapter skipping and selection, trim silence and enhanced voices for an improved listening experience, and more. Many users have grown frustrated with Apple's own dedicated Podcasts app, despite an update last year that Apple said was aimed at introducing a "richer" user experience. As more and more companies begin looking into the podcast market, Apple has been making moves that should beef up its own app, including the acquisition of podcast search startup Pop Up Archive last December. I’ll give Castro a shot. $3 for three months seems like a reasonable trial fee. I’m subscribed to around 15-20 podcasts at any one time, and PocketCasts has been my go-to podcast player for years, whether on iPhone or Android. PocketCasts checks all the boxes. But I like to change things up and try something new. Apple’s Podcast app is pretty and easy to use, but no silence-skipping is a non-starter at this point. Skipping all those small silences really adds up over time. I’m heading over to the App Store now to give Castro a try. Genuinely curious... Overcast is likely THE biggest 3rd party Podcast app, one I have used for years. Marco can be pretty darn abrasive sometimes, but I just don't see him not fixing a major crashing bug, nor have I heard or seen a crashing bug "opening every time." I don't doubt you a bit, just wondering what device / configuration you are using that causes this as I have never seen such an issue with a product I frankly love. That’s an iOS issue I’m afraid. Even with no apps running it’ll kill the battery trying to get a signal. I just put it in airplane mode when heading out to remote areas. In the city I’m not usually in a bad signal spot for long enough for it to matter. Yes, definitely an iOS issue. And I use airplane mode to counter the battery drain. But when I check the battery stats in settings, it’s only the podcast apps that use a crazy amount of data when I’m in a really bad signal area. The thing that perplexed me is that 90% of the time my podcast apps just run the battery down a little bit when there’s low signal, and sometimes I can lose 20-40% battery in a few hours. Very random behavior. But I love podcasts, like I loved radio as a kid in the 70s, so I’ll pay whatever price in battery drain. By far my most used apps are for podcasts and audiobooks. What are you gonna do? I paid $10 upfront for an annual subscription to Overcast, and then a couple of months ago it stopped working COMPLETELY. It crashes upon opening every time. Have you tried deleting and reinstalling it? Definitely like the new update.. but it's missing an iPad app, unfortunately without that.. can't move away from PocketCast. The big test will be about battery drain. PocketCasts will once in a while go crazy on the battery drain if I’m in a poor signal area. Overcast would do the same once in a while back when it was usable. If Castro doesn’t kill my battery, it’s visual appeal may win me over. I’m a sucker for thick, smooth fonts and buttons.